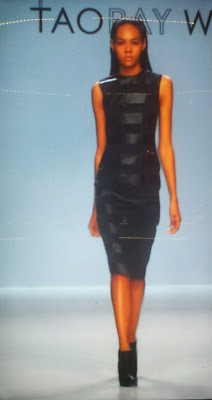 From the Angel Sanchez Fall-Winter 2015 collection. Photos by Yours Truly. THIS is an Angel Sanchez production. 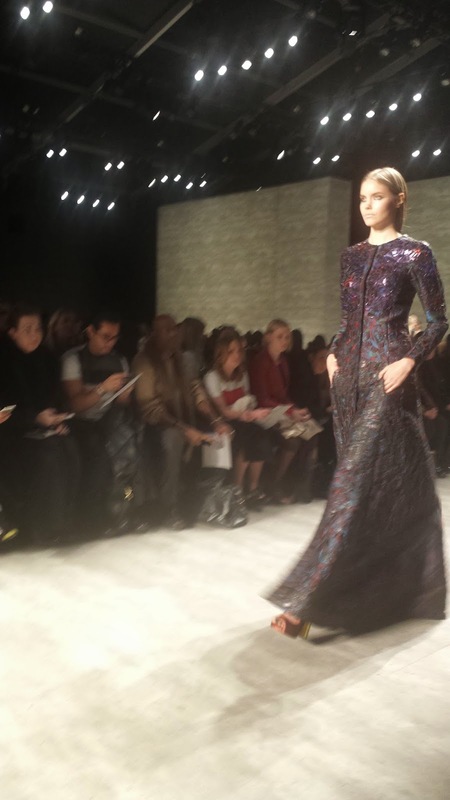 Yet, it is so easy to believe that one is in a Carmen Marc Valvo show, for instance. Another craftsman about his business. Everything is done on a superior scale: fabrics, cuts, colors, lengths. No gimmicks. Not a hair out of place. (See video at top.). 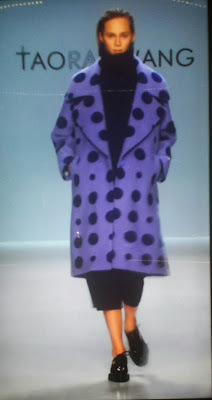 From the Taoray Wang Fall-Winter 2015 collection. PLEASE, you are saying too much simultaneously. 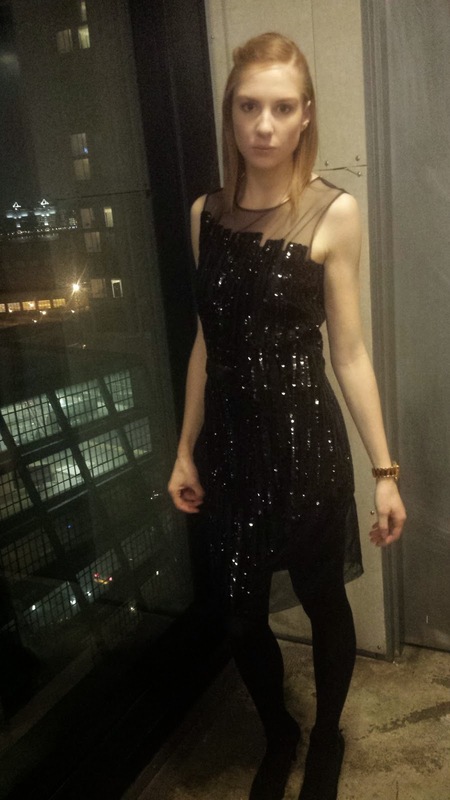 On the one hand, I infer micro-mini dresses. In the next breath, my ears are assaulted with mannish pants. Elsewhere, a whisper of minimalist shifts. Moreover, the plaid series? Really? Sound arguments. What's needed, however, is one coherent statement. Thanks. What's not to like about T.Tandon? Surely, something – for no one or nothing is perfect, of course. But it is difficult to find fault with this line created by Tina Tandon. The FIT grad showed her fall winter 15 collection at the TechStyle NYC popup space at The House of Bumble. FW 15 is inspired by the winter garden. “I'm always inspired by nature," TT says. (See video above). It becomes apparent in a bunch of crystals on the bodice of a sleeveless dress in the color of a winter sky. A black shift with streaming paillettes or sequins references a rainfall, perhaps even icicles. This is TT's fourth line. After graduation, she cut her teeth in the business working with such houses as Escada and Christian Lacroix. In fashioning her garments, she relies heavily on bio-degradable and sustainable fabrics. Her consciousness does not end there, however. A portion of proceeds from sales goes to support charities that help poor children in India, hopefully rescuing them from the horrors of child labor. Further, TT says she mainly produces her line in factories owned by women. Visit http://www.ttandon.com to learn more about T.Tandon. Yours Truly is in search of some sustenance. It is at this moment that I meet the very affable Annie. “Would you like some tea,” she asks with a high-wattage smile. 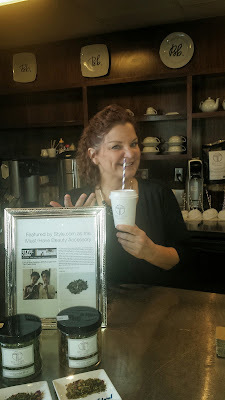 Annie, brand ambassador for Big T NYC. I have just approached the counter in the corner of the 8th floor room of The House of Bumble. Normally, food can be foraged in this quarter. In progress is TechStyle NYC, a popup retails space where various manner of business connected to the fashion industry is marketing wares to the media and tastemakers invited through the doors. It's as if the Indiana native were waiting for me to ask that very question. She launches into a delightful spiel about how her niece (Theresa Krier), who formerly worked in the fashion industry, created Big T NYC. The daughter of her brother observed backstage at the fashion shows that the parched models would not drink the juices and sodas – and can one blame them??? To that end, she put on her thinking caps and in late 2013 what TK&Co. call the world's first couture tea brand was birthed. It's organic, too. This excited Anne to no end. She recalled how it came from Africa – no – was it China??? “No, I think it was China,” Annie determines, hedging and entreating me not to think ill of her for not unequivocally knowing this one major detail. 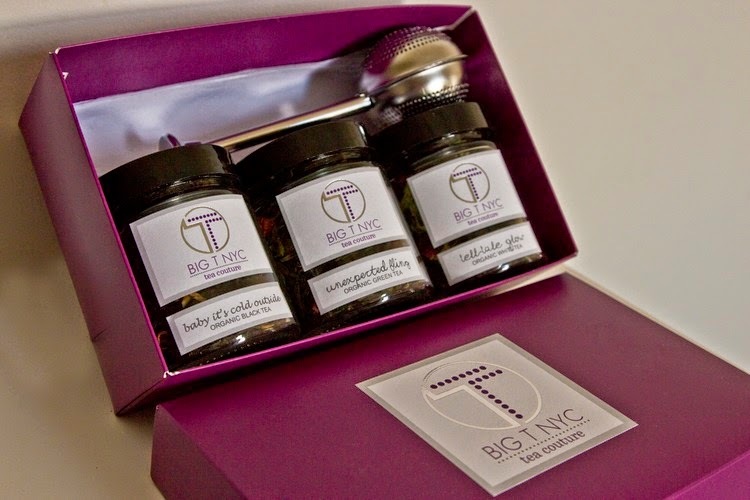 The Big T NYC Couture Collection gift set contain the three Big T NYC organic teas, an infuser, and a tea-making guide. Photo from Big T NYC Web site. No worries. We are clear on the other salient points. The tea is organic. At the moment there are three blends: Baby It's Cold Outside Black Tea, Unexpected Fling Green Tea and Tell-Tale Glow White Tea. They are available backstage at many shows during New York Fashion Week and Mercedes-Benz Fashion Week (and elsewhere). Finally, it is not sourced from Africa, China. http://www.bigtnyc.com/ to learn more about Big T NYC. LATER, I'm going to do some live art,” Bradley Theodore volunteers as he quickly and deftly paints the rims of a pair of sunglasses. 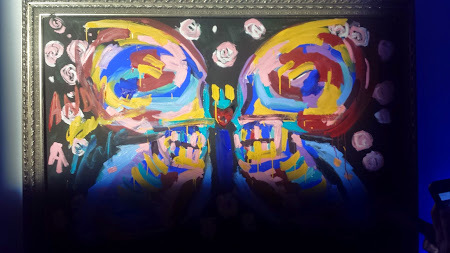 “Isn't this live art, “ asks Yours Truly, pointing at the ministrations being applied to a pair that has a passing resemblance to the Ray-Ban Wayfarer. The digital media specialist and street artist utters nary another word, but methinks I glimpse a smirk. We are at the store opening party for the Italian eyewear brand, Italia Independent. The specialty label is setting up shop in Soho at 85 Mercer St.
Visit http://www.bradleytheodore.com/ to learn more about Bradley Theodore; visit http://www.italiaindependent.com/en to learn more Italia Independent. Bradley Theodore's live art is finished.